This book analyzes how, and under what conditions, African International Economic Organizations (IEO) have evolved, and what individual and collective contributions, if any, these African IEOs have had on Africa's socio-economic development. 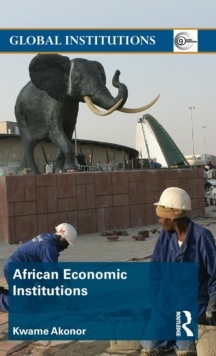 Providing a comprehensive and accessible overview, the book covers the continent's main IEOs, The United Nations Economic Commission on Africa, The African Development Bank; and The New Partnership for Africa's Development as well as the five major Regional Economic Communities, including Economic Community of West African States, and Southern African Development Community. Assessing the degree to which African IEO's have been able to chart their own course in coming up with their development agendas and priorities rather than following the lead of Global Institutions, this book:Provides a descriptive and analytical overview of the historical and contemporary development blueprints produced for AfricaClearly examines the contribution made by African economic institutions towards developmentConsiders whether African economic institutions are building blocks or stumbling blocks in Africa's developmentOffers a detailed evaluation and critique of African IEOsEnabling the reader to reach a deeper understanding of the challenges and potentials of development on the African continent, African Economic Institutions will be of interest to all students and scholars of African politics and development studies.